You can view a patient's entire image history chronologically and quickly navigate between each image. Also, in the history view, you can view individual images larger than you can in the recent images view, and you can process (such as enhance or annotate) an image. For information about using the recent images view, see the "Viewing recent images" section. For information about processing images, see the "Processing images" section. On the Patient menu, under Clinical, click (or tap) Chart, Progress Notes, Quick Exam, Treatment Planner, Perio, or Imaging. Then, on the Imaging tab's menu, click (or tap) Show Image History. 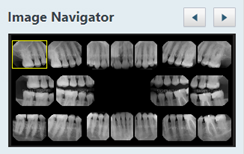 The patient's imaging page opens to the history view, and the most recent image or series (such as a full mouth series or bitewings) is selected by default on the Images tab. If needed, filter the list of images on the Images tab to display only the images that match the filter criteria that you specify. Click (or tap) in the Narrow down the results field to view the available filters. Date - To view the images according to a different date, select the desired date in the list under Show images taken on. To view all images that have been acquired on and after the selected date, select the All since that day check box. To view the images that were acquired only on the selected date, clear the All since that day check box. 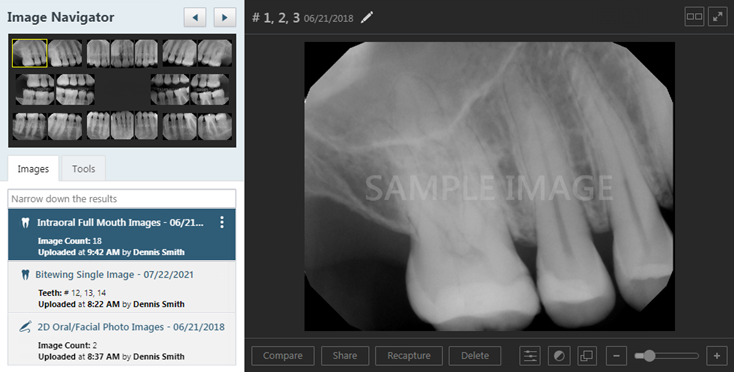 Type - To view images in any category (intraoral X-rays, intraoral photos, intraoral photos without tooth numbers assigned, and extraoral X-rays, and/or extraoral photos), select the All types check box. To view images in only certain categories, make sure the check boxes of only those categories are selected; the other check boxes must be cleared. 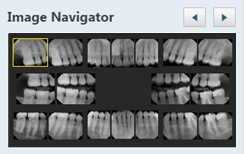 Teeth - If the Intraoral X-ray and/or Intraoral photo check boxes are selected, to view those types of images for specific teeth, select the desired teeth on the Tooth Chart. The tooth filter does not apply to intraoral photos that do not have tooth numbers assigned to them and extraoral X-rays (which apply to all teeth), and extraoral photos (which apply to all teeth). To clear all tooth selections, click (or tap) the Clear selected link. Show everything - To set the filter options to their default states and display all the patient's images, click (or tap) the Show everything link. The image list displays the images that match your filter criteria. Click (or tap) the X in the upper-right corner of or anywhere outside of the Narrowing Down the Results menu to close the menu. Navigate the series - If you have selected a series (such as a full mouth series or bitewings), to navigate between the images of that series, click (or tap) each image of the series under Image Navigator. A larger version of the current image (highlighted with a yellow box) in the series appears in the viewing area. Note: You can also click (or tap) the Previous and Next buttons to navigate between the images in the set. Zoom in/out - To increase the zoom level (zoom in), move the Zoom slider to the right. To decrease the zoom level (zoom out), move the slider to the left. If you are using a mouse, you can also zoom in and out by positioning the pointer over the image (the pointer will change to cross hairs) and then rotating the scroll wheel of your mouse. If you increase the zoom so that the whole image no longer fits in the viewing area, the Pan dialog box appears. Drag the red box around on the thumbnail image in the dialog box to display the area within the red box in the main viewing area. 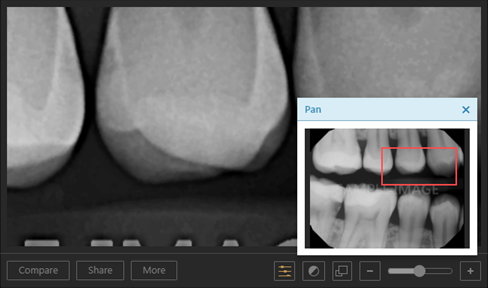 Quickly resize - By default Dentrix Ascend Imaging displays images as large as it can in the viewing area. This can cause the images from some older devices or programs to look fuzzy or grainy. To view the image smaller and sharper, click (or tap) the Smaller/Larger button . The button becomes orange . To view the image as large as it can be and still all fit in the viewing area, click (or tap) the button again. View full screen - To view the image full screen, click (or tap) the Full Screen button . To return to the normal view mode, click (or tap) the Normal Mode button . Click (or tap) an image in the viewing area to view only that image. Click (or tap) an image under Image Navigator to view only that image. Click (or tap) the Single Mode button . Note: You can zoom in and out while viewing a series.